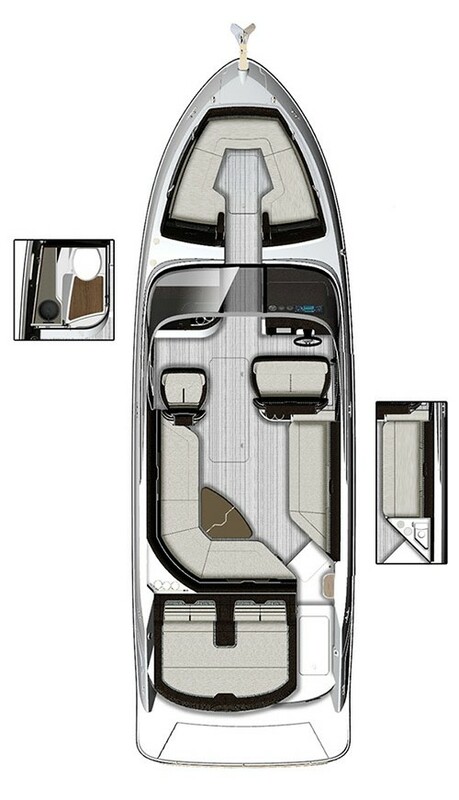 The 280 SLX delivers a higher level of excellence that you’ll see and feel. Upscale styling and a gorgeously sculpted hull make an instant impression while slicing through the water. Craftsmanship is apparent down to the last stitch. Cutting-edge technology makes a statement at every turn, thanks to innovations like Dynamic Display and Quiet Ride™, featuring Tuned Transom®. Captain and passengers alike are treated to smooth, responsive performance and ample amenities, like the optional wetbar, to extend day into evening. After all, luxury loves company. Mercury’s SmartCraft Digital Throttle & Shift (DTS) system delivers effortless command of your engine and puts control at your fingertips. Performance is more predictable and responsive than ever before. Captains, start your engines. The 280’s innovative helm offers Sea Ray’s Dynamic Display, a feature as gorgeous as it is intuitive. A 12.3 Medallion touchscreen, glass lenses, low-glare blue night lighting and chrome bezels paint a pretty picture, while the system’s tachometer with depth/water temperature gauges, engine alarm, trim level, digital speed control and more delivers ultimate confidence and control. Optional wet bar with sink.